How Can We Find Out What Our Customer’s “Hot Buttons” Are? The best way to find out what your customers hot buttons are is to ask him. You don’t exactly put it that way; you can say, “What are your biggest concerns about this project?” Or, “What are you most worried about that might go wrong?” I’m always surprised at how reluctant people are to ask their customers these simple questions, especially since the customer would probably love you to ask. Like anyone else, your customer likes talking about himself. Once you’ve asked your questions, you need to capture all you know about the customer’s driving force with regard to this project. You can do that by conducting a “win strategy session.” Here’s how it works. Call a meeting and invite all the people who have had some meaningful contact with the customer. The people you invite could be technical staff who are working on a current project with the customer. Certainly the sales lead/account manager should be there. Plus, you could invite people who have had dealings with the customer in the past. Next, make a list of all the concerns the customer has expressed about this project-what he hopes to see as a result, what he is afraid might happen to short-circuit the project, and any biases he may have. I usually use a flip chart and an easel. I draw a line down the center of the paper, and list the concerns on the left. Once you have exhausted what you know about the customer’s concerns, prioritize them. Write a 5 next to the ones that are the biggest concerns, down to a 1 for the smallest. Now you have a good idea what the customer is most concerned with and what you need to make sure you address. Next, write “Our Resolution” at the top of the right hand column, and proceed to brainstorm what you can offer the customer to resolve each and every one of his concerns. By the time you have finished this exercise, you are miles ahead of where you started. You have a list of your customer’s hottest buttons, and you have a solution for each. 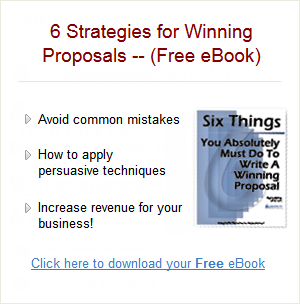 Now you’re on the road to writing a winning proposal that offers what the client knows are genuine benefits to him.